Telfair County, Georgia is located in South Central Georgia; 154 miles from Atlanta, 70 miles south of Macon, 110 miles from Brunswick and 128 miles from Savannah. McRae-Helena boast of being the Crossroads City of Georgia with Highways 441, 341, 319, 280 and 23 all intersecting together at this junction. McRae Helena is 30 miles from Interstate 16 and 70 from Interstate 75. Highway 341 is now four-lane from the Brunswick Coast to Perry, GA where it intersects with Interstate 75. Many travelers think the only way to get from the beautiful coastal area of Brunswick, St. Simons, and Jekyll to Macon and points north is to traverse I-95 to Savannah and then pick up I-16 and travel west to Macon. If the now recently four-lane Hwy 341 were traveled instead, it would save them approximately 50 miles. They would also be able to enjoy many beautiful and historic sites along the way. Telfair County offers two different industrial parks. The one located in Lumber City has four spec buildings that can be finished to the specifications of the customer. One or any combination of the four buildings can be utilized. The industrial park in McRae-Helena is located on Hwy 441 and 280 and is approximately one mile from Hwy 341. There is an existing railroad spur located on this property and highway road frontage on Hwy’s 441, 280 and 319. • Competitive labor rates, with the weekly average wage being $686, well below the state average. In the recent 2016 Census Estimate, the working age force represents over 60 percent of the population, 20 percent represents school age, and the other 20 percent is retirement. • Very little traffic congestion within a fifty-mile radius. This alone offers a less stressful home and work environment. • An educational system offering an outstanding academic program at all levels as well as a strong athletic program. All schools have recently undergone renovations and a completely new elementary facility. Further improvements are being made now. The current graduation rate for the county is 85 percent, which is greater than the state average, which is 80.6 percent. The overall graduation rate for labor draw area is 87.2. • A state-of-the-art community recreational facility that offers activities for all ages year round. • An abundance of water that many areas are sometimes in short supply. Telfair County is located on two water aquifers; the Southeastern Coastal Plain Aquifer and the Floridan Aquifer. • Two railway systems are available for transportation needs. The Norfolk Southern and the Heart of Georgia both service Telfair County. State and local incentive packages are available to qualifying industries and businesses. The Development Authority of Telfair County has assisted new and existing industries and businesses by offering tax incentives that allow for growth and expansion. The Authority has also built and/or retro-fitted spec buildings to the end consumer’s needs. In addition to qualifying tax incentives, Quick Start Job Training is available through the local Oconee Fall Line Technical College campus and the Dublin campus. The Quick Start Program is provided by the Technical College System of Georgia and is offered to businesses and industries to assist in growth and development free of charge to companies that qualify. 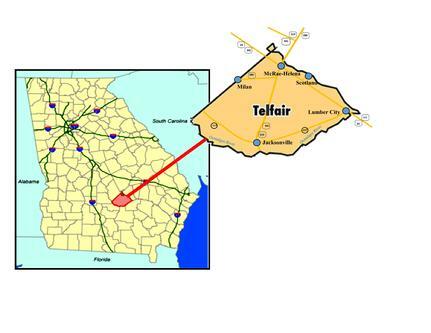 The local airport is jointly owned by both Telfair and Wheeler Counties and is located three miles from McRae-Helena. The runway was recently expanded to a length of 5,001 feet and a new fuel farm that offers jet fuel and AvGas was installed in 2017. Further expansion and growth at the airport is underway through the funding of FAA, GaDOT and both local county governments. This project has been ongoing for the past ten years with both communities actively and aggressively involved. While the county does not have a local hospital, they do have an up-to-date Urgent Care Center and other medical facilities along with ambulance service. Telfair County is located within 30 minutes to five hospitals, with three of them being considered regional. The governmental entities of Telfair County have recently taken proactive approaches to implementing cost savings measures to ensure citizens receive the best possible services for their money. An example of this is the combining of the two cities McRae and Helena. These two cities were next door neighbors, with both cities having a common boundary line. Both cities were in need of resources and infrastructure the other one had so instead of duplicating services it was decided that in order to provide these much need services and assets in the most cost-effective manner, the combining of the two cities would greatly benefit everyone involved. This was accomplished with a New Years Eve Midnight Ceremony in 2015. While it might not have been a 4th of July celebration, it was definitely a celebration of marriage between two entities that has sparked revitalization efforts on the part of local governments, businesses and citizens. One local citizen, in the entrepreneur spirit, took upon himself to buy two unoccupied, downtown buildings. He then set about turning them into modern and up-todate apartments. These apartments have been continuously occupied. Through his foresight and efforts, he has not only preserved a part of Telfair County’s history, he has inspired others to revitalize older buildings and use them to preserve the atmosphere of small town America that the citizens of Telfair County so treasure. For the naturalist, Telfair County is an oasis offering up rural roads that provide a panoramic view of the countryside for those who enjoy exploring on bicycle or motorcycle or enjoy the pleasures of watching and enjoying nature at its best. For the hunters and fishermen, world class turkey, deer, quail, duck, dove and wild hog hunting is available. Fishing is provided along the western boundary by the Ocmulgee River. Since 1932, until recently, Telfair County held the record for the World’s largest bass. This record was recently tied. A record held for seventy-seven years. For the citizens of Telfair County, this is absolutely the best place to live, work and play. The common goal is to make Telfair County a place that provides and maintains economic growth to ensure the retention of its most valuable resource, younger citizens. The County invites businesses and industry who appreciate being a part of a community that offers the best of an overall work, live, and play environment. For more information, click on the below links.